Silent Hood was inspired by real world events. I wrote it after the 2016 Presidential Election. 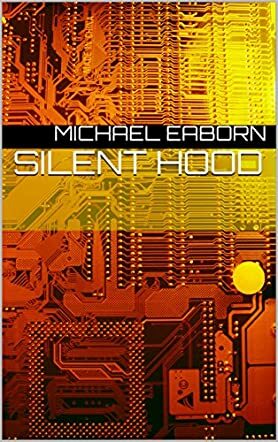 Silent Hood is a political dystopian novella written by Michael Eaborn. Violence has fast spun out of control, with Donald J. Trump as newly elected President of the United States. Laws and the Constitution are quickly turned on their heads, with the new reality of a totalitarian government. Standing firm against the new regime, Michael Gates does all he can to enforce justice on those who take pride in hurting, torturing or killing others. With Michael’s grandparents having been shot while in their beds when Michael was a child, he vows to continue the battle between good and evil. President Trump enacts Martial Law, putting a bounty on Michael’s head, while declaring all non-military personnel to be shot, should they be on the streets after the strict 9.00 pm curfew. Unaware of the new laws, Michael is arrested and presented to his torturer and captor, General Steve Bannon, only to discover that the General has his own special plans for the young vigilante. Very descriptive and eerily realistic, Silent Hood shows the possible future of the United States of America, with a maniacal dictator at the helm. The hard work of the vigilantes, who are determined to keep real law and order in play, is well written, and the egotistical attitude of the man in the Oval Office is true to form, with an avoidable outcome also presented. Michael Eaborn’s style of writing is highly imaginative and packs a real punch. I was easily able to visualize the brutality as clearly as if I had been watching it all on a high-definition, large–screen television. The chill that went down my spine, however, knowing that this book may, indeed, become a reality in the blink of an eye, was strong. Some pages found me with a tear running down my cheek, picturing what life would become, should the words in those pages become reality. I fully recommend Silent Hood to all readers over the age of 15, who are well-informed about the current events of the world, and the shielded darkness that many in today’s society live in.